Palm oil refining industries are most important manufacturing sectors in the world and Palm oil has become an increasingly important vegetable oil in the world market and today is the largest traded vegetable oil in the world. Indonesia & Malaysia are the largest producer and exporting company of Crude Palm oil. Crude Palm oil is obtained from mesocarp part of palm oil. Extracted Crude Palm oil contains some undesirable impurities and these some of the impurities need to be removed partially or completely through the refining process in order to produce good edible oil that have better stability and keepability. Now a days Palm oil is popular cooking oil in some tropical countries like South east Asia, Africa, and some parts of Brazil. It is broadly used in other countries because of lower cost and good oxidative stability. Palm oil is used widely for cooking due to its heat resistant property as compared to any other vegetable oil. 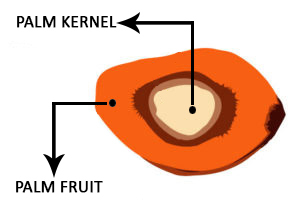 The unique and best quality of Palm is that it produces two types of oil: – Palm Oil and Palm Kernel oil. Palm oil is extract from the flesh of the Palm fruit and Palm Kernel Oil is extract from the seeds or kernel of the Palm fruit. The palm oil is extracted by the fresh palm fruit flesh by pressing & centrifugation. The palm oil extraction is to be done with the fresh palm fruit to avoid the deterioration of palm oil so the countries doing the cultivation are extracting the oil themselves. The crude palm oil comes out as yellow red or dark yellow in color and the taste of the crude palm oil is sweat. The Crude Palm Oil Extracted contains the unwanted impurities which effect adversely on the physical appearance, quality, oxidative stability, shelf life of the oil. In order to remove the above impurities, the oil goes to the refinery plant in order to receive the RBD Palm Oil (Refined Bleached & Deodorized). 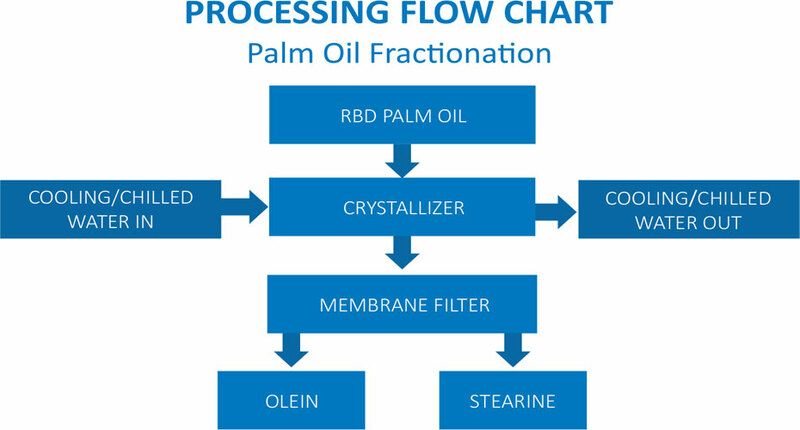 After refining of the palm oil the RBD oil goes to the fractionation section in order to get the palm olein and stearin. The term refining includes the removal of above impurities in order of increasing shelf life and quality of Refined Vegetable oil. Generally, refining process is necessary steps for the production of edible oils and fats products. The qualities of the finished product that need to be monitored are flavor, shelf-life, stability and color of the products. Refining of crude vegetable oil is done by two methods: Physical refining and chemical refining. During refining of crude palm oil, FFA are removed in order to achieve the FFA content of up to 0.1 % max. Physical refining generally has a lower environmental effect than chemical refining. The bleaching of edible oils and fats is an important part of the refining process of crude oils and fats. It does remove the several contaminations which impacts adversely the physical appearance and quality of the oil. Generally, the oil before taking to the bleaching section, the gums treatment is done by the phosphoric acid treatment so that these gum can be separated in the pressure leaf filter after bleaching. During this stage, trace metal complexes such as iron and copper, coloring pigments, phosphatides and oxidative products are removed by adsorptive effect of bleaching earth. Mectech’s unique design of the bleacher keeps bleaching earth in full suspension due to which there is no dead areas inside the bleacher which in turn gives lower utility consumption. Since the bleaching process is carried out under controlled parameters, the good quality oil is guaranteed in Mectech Bleacher. As we know that refining of edible oil is basically divided in to two parts: – Physical refining and Chemical refining. In both process deodorization steps is require but the working principle of deodorizer for both the process is a little bit different. In the physical refining, the FFA are removed in the Deo Section. Since the palm oil is the hard oil, it requires the physical refining due to high FFA content in the crude palm oil. Deodorization / De-acidification is done to remove the volatile components, mainly aldehydes and ketones, which causes for smell in refined oil. 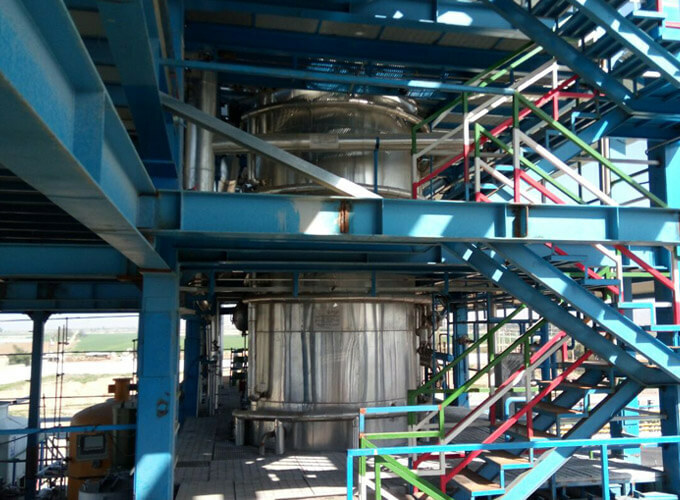 In Deodorization process, free fatty acid removes in the form of Palm fatty acid distillate as a refining waste. In Physical refining the role of deodorizer is to strip free fatty acid, odor removal and heat bleaching to cut the remaining color in bleached oil. 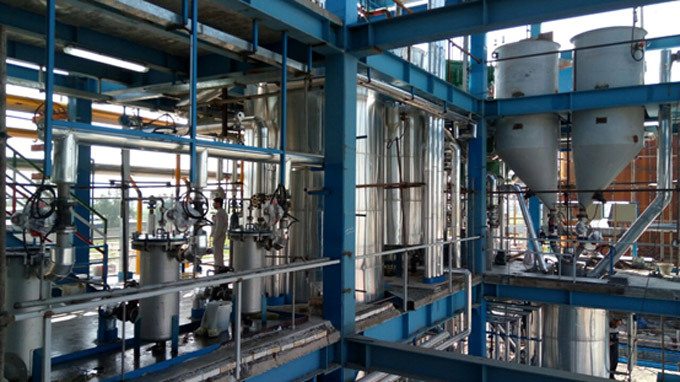 In chemical refining the role of deodorizer is odor removal, heat bleaching to remove the remaining color and recovery of fatty acid distillate. The steam is injected in each compartment of our deodorizer so that intimate mixing of oil and steam takes place. This arrangement of steam pipes makes deodorization process more efficient. After the Deodorization section the oil is first cooled by cold Fractionated oil for maximum regeneration of heat. Then the same oil is cold by cooling tower water up to 40˚C to 45˚C. Then this oil is cooled by outgoing chilled fractionated oil from the filters. This oil is then chilled to fractionation temperature in the Crystallizers. In the crystallizer proper residence time is given with maintaining the temperature of the oil, which results in formation of wax / stearin crystals and residence time, will give proper growth to the crystals. The step cooling is followed in the crystallizer for the complete maturation of the crystal which increases the efficiency of the Fractionation Plant. The oil is cooled with the tempered water and then it is further cooled to the final fractionation temperature by the Chiller water. The water in chilled in the chiller. 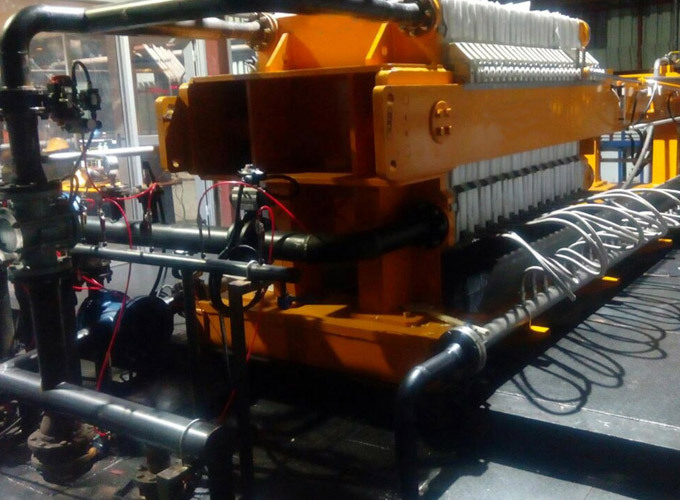 There are mainly two kinds of chillers available in the market, one is the power chiller and another one is the vapor absorption machine. The VAM is widely used in order to avoid the use of the refrigerant gases. After obtaining the desired temperature inside the crystallizer the mixture is then feed to the Filter Press for the separation of Stearin from palm olein. The recovery of the Palm Olein does also depends upon the kind of filters used. The complete operation is controlled by Automatic Electronic Panel (PLC /SCADA).